The following exercises are given for the development of mental power within yourself. Seat yourself in a chair, in your own room if possible, or in one in which you will be undisturbed. Take a positive position, sitting upright, but comfortably, so that you will be as unconscious of your body as possible. Now close your eyes and try to visualize the room as a mental room, or one within your mind in which you are going to fill full of and confine the mental qualities of Discrimination, Strength, the Power to Concentrate, and Truth, for your future and continuous use. Then try to realize that you are actually a center of God's consciousness, for in His consciousness we all live, move and have our being; and that this mind which you call your mind is a center or focal point of His Mind — just as the consciousness of each cell of your body is a center or focal point of your mind — and that therefore deep within your mind there must be always present and ever available God's Love, Intelligence and Power; in fact, all that God Is in His Consciousness. 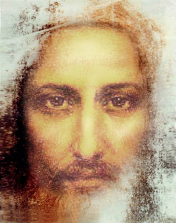 Now try to "see" this Consciousness — the Holy Love or Spirit of God — pouring forth from deep within and flowing through and radiating from you to all other centers of His Consciousness as a brilliant White Light; which Light in very truth is the Spiritual Self to one who has the inner sight, for It is the Light which lighteth every man that cometh into the world. Therefore realize that you are that Light, and that your mind being a part of God's Mind, you can consciously and actually call forth from within that Mind — if motivated and accompanied only by unselfish Love — any needed quality, for in It of course exist all God qualities. Therefore "see" your Light ever shining and going thus before you, lighting fully your path and making everything so clear that no possible shadow can intrude to deceive or hinder your perfect spiritual sight and hence your fullest understanding. This gives true Discrimination. Likewise, to your right see this Light radiating and pouring forth from you into the mental atmosphere of that part of your room as the Strength of Divine Mind, ever ready to support and sustain you in any need, and to enable you to do anything you wish to do. While on your left see the great Light of Truth likewise flowing forth to fill that part of your mentality, so that whenever you need to know anything, no matter what, it is ever ready to flood your consciousness and to make all clear to you. And then back of you, see this great Light from within pouring forth and filling that part of your mentality with the Power to concentrate and focus it, whenever you want to direct your mind upon any given idea or to any desired end. Just see this Light as a mighty Power ever back of you, waiting to pour through your consciousness (as through a funnel) in which is held the idea you wish clearly to understand or the picture that you wish to outmanifest — whenever you call upon this Power to direct the Light of Divine Mind upon it. See your intellect or visioning faculty (located in the front of your mind back of center of forehead) serving as a lens to focus the Light and reflect the perfect picture in the outer realms of consciousness or of physical manifestation. Just as the light pours through the small lens of a magic lantern, when you turn on the electric power, and throws the picture on the plate upon the screen, so will this Power, when you thus consciously direct it with intense purpose, cause the Light, Life and Substance of Divine Mind to pour into and through the idea or picture you are holding in your mind and will outmanifest it either as a perfect knowing or as the fulfillment of your desire. Study this last carefully and prove it, for it can be used to acquire any needed wisdom, power or ability, or to create and make manifest any righteous thing or condition. But be very sure you have the approval of your Higher Self of that which you wish manifested; for it should never be attempted unless inspired by a loving desire to help someone or to fit yourself for the Father's use. This rounds out your mentality, filling it full of those qualities that you want ever available for use. Any other qualities can be similarly brought forth and made available. The practice of actually calling forth these qualities from within you and "seeing" them surrounding you and filling your mental room, thereby creates an aura that will always surround and protect you. For it will be of such high vibration, because of the brilliancy of its Light and the Power of Love radiating from it, that none of the forces of darkness can penetrate or even approach. 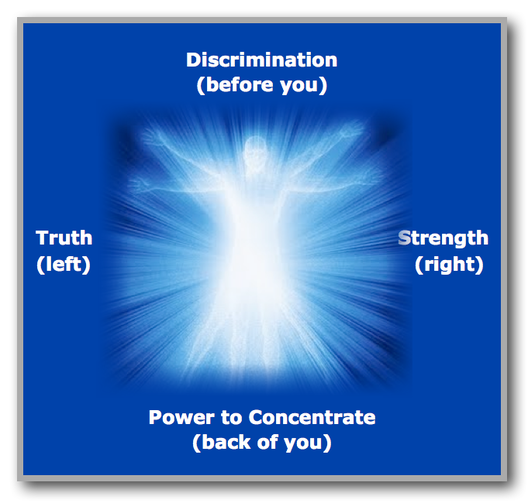 The powers of Discrimination and Truth thus built into your aura will instantly detect any inimical or inharmonious vibrations and enable you to know how to deal with them. This practice also will gradually, if you do it faithfully day after day, make you conscious of the mighty Power you are, and of the wonderful instrument you have in this mind of yours, as you learn to make it obey your slightest command. This is what is meant above where it said that these exercises are for the development of mental power within yourself; they are that you may not only develop power, but that you may become Power, may learn to know Who you are and of What you are a part. But always remember that Power and Knowledge avail nothing unless Love inspires and directs their use.